I'm back from a crazy fun trip to Fort Lauderdale and Miami, Florida! I can't wait to tell you more and show photos (of all the yummy, unhealthy food I ate) very soon. While I was in Florida, I got to see a few college campuses and all of them were busy with visiting prospective students and families. It reminded me of my last summer of high school when I went on trips with my family to visit schools up north because I was so convinced I wanted to go to college in New York City…until I actually visited the campuses. It's one thing to see photos and read brochures on the schools you're interested in, and it's another thing to actually make a physical visit and see how being on the campus really feels. I get emails with this question quite often, "How do you know which college is best for you?" and that's a tough one to answer because only you know what's best for you. 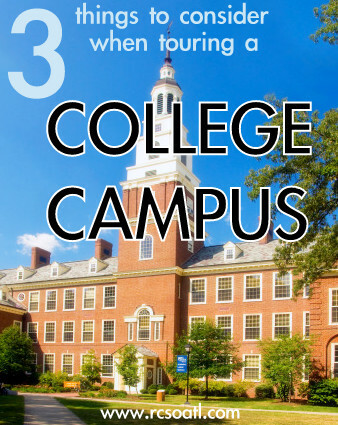 But, these are three important things to consider when visiting one of your prospective schools that can help you make the best decision for you! 1. Day in the life of a student | When you visit a college, I encourage you to ask your tour guide or any friendly student what their typical day looks like. This can tell you so much more about a college than any brochure or ranking. Current students are usually willing to share their experiences with prospective students because they've been in your place. It's great to be on a college campus and hear how a current student participates or doesn't participate with the campus on an average day. It's helpful to hear when a student wakes up, how their class schedule works, if they have room for other activities before/in between/after classes, and how much they enjoy the average week on campus. 2. Campus values & culture | Another important thing to consider is if the college's values are aligned with your values. If you're very adamant about recycling and living "green," you may be more interested in a college campus with an organized and effective recycling program and energy efficient buildings. Or if you believe in a particular faith, you may want to attend a college that has programs supporting that faith. In my case, I appreciated that my college supported student involvement, student leadership, diversity and inclusion, academic rigor, research opportunities, and the overall culture of achievement. When you're visiting a college, be observant and take notes on the things you see or hear that you like and/or don't like. Different people have different non-negotiables. 3. Does it feel like home/do you want to stay? | I remember visiting some schools up north and feeling so uncomfortable and out of my element. Even though the academic programs were interesting and well-ranked, I just could not see myself living on campus or walking to class in an area that didn't seem like a true college campus. I visited several schools that just didn't feel like home and I was ready to leave soon after arriving. And then there were a few schools that I could easily imagine myself going to and enjoying the campus life. I did not want my visits on those campuses to end and they felt like home. When I was an orientation leader at my college and I talked to incoming freshmen about why they chose to attend Georgia Tech, the most common answer was "it just felt like home." What made you decide on your college? These were literally all the things I did NOT consider when I chose my school. Seriously wish I had you around three years ago. I forward this post to a family member of mines who can really use the advice! They are clearly not getting it when me and other family are trying help out so maybe something tangible for them to read just might click... hopefully. Thanks for sharing! These are great tips, really trying to embrace the college and see if you can picture yourself walking through the campus daily is so important! 2 months of no straightening…check!